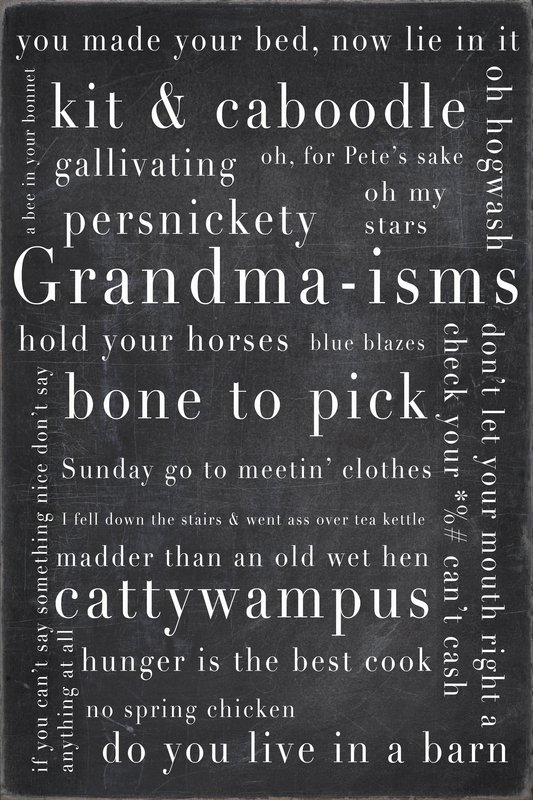 It is with both trepidation and sorrow that we bid Grandmothers’ week ado! 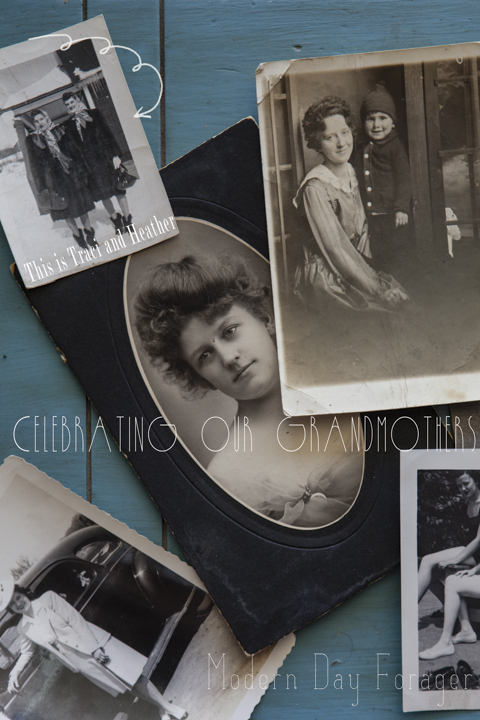 We have had such a wonderful time just jabbering about our grandparents (hmmm… could a Grandfathers week be in the making?) and sharing just a fraction of those memories with each other and in turn our followers/you. 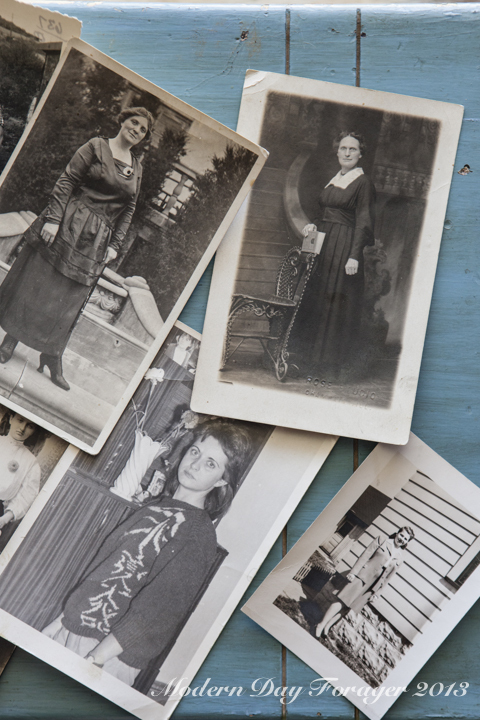 We started our week with a brief history of our grandmas’ and the incredible influences they had on us as people and as chefs, then we asked for your input and stories, thank you again, to those of you that shared with us. Your stories just re-emphasized our belief that these women shaped our future, one generation at a time, from what we think to what we eat, from what we say to how we say it and the whole time with humor and love sprinkled in for good measure. 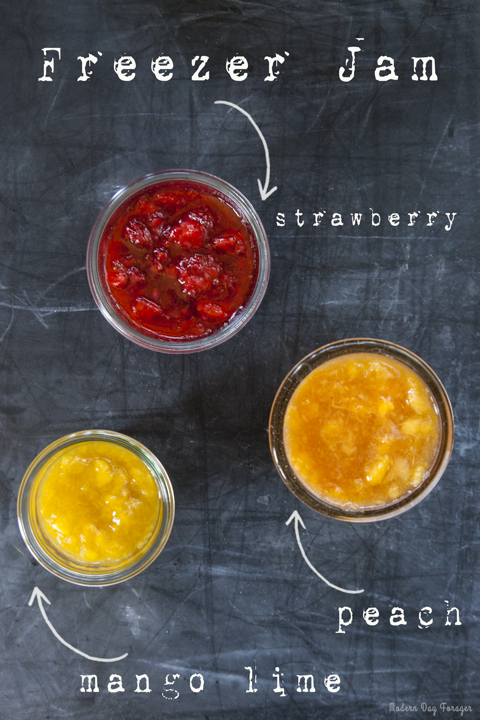 Next we dove into summer (and head first into Heather’s grandma’s freezer) with a tasty, super simple and incredibly versatile freezer jam that just may become one of the things your grandchildren look fondly back on, that you made for them every summer. 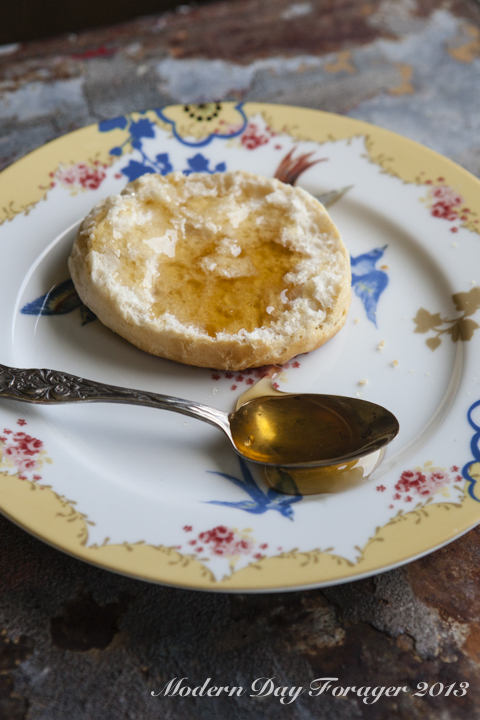 Every meal that came to my grandmother’s table included bread and butter, you may ask, “what does that have to do with the price of tea in China” let me tell you… no bread brought more smiles than fresh from the oven biscuits and oh by the way, what goes great with all that freezer jam? That’s right…biscuits! 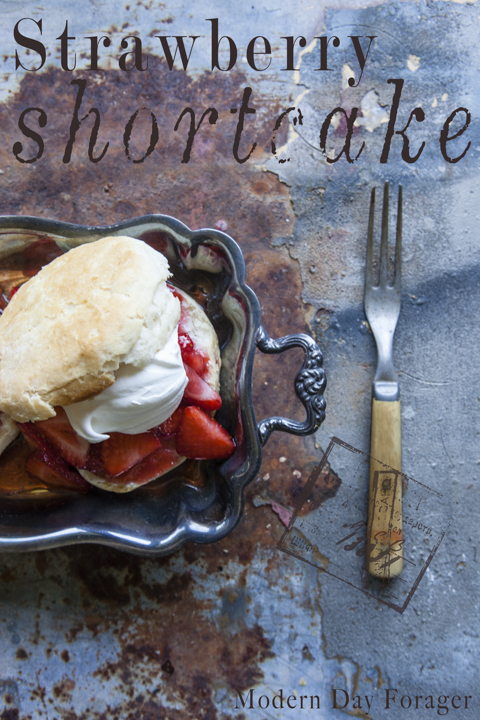 It didn’t take us long as we tested our biscuit recipe to decide the next recipe had to be strawberry shortcake. 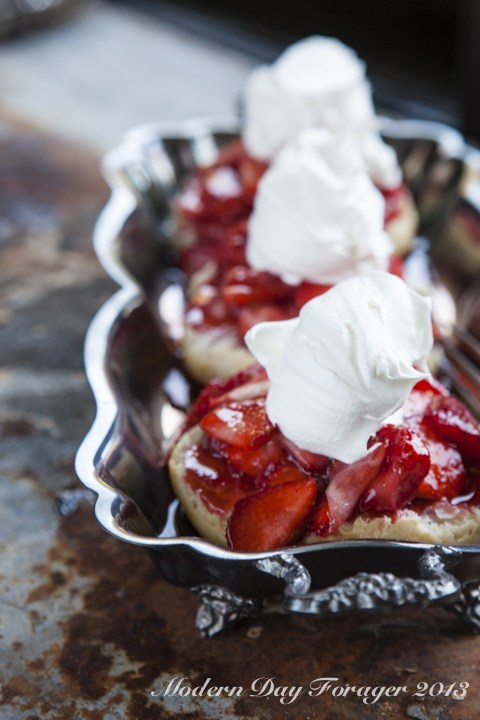 The biscuits make a wonderful vehicle for the sweet summer berries and will hold up to copious amounts of whipped cream and syrup. 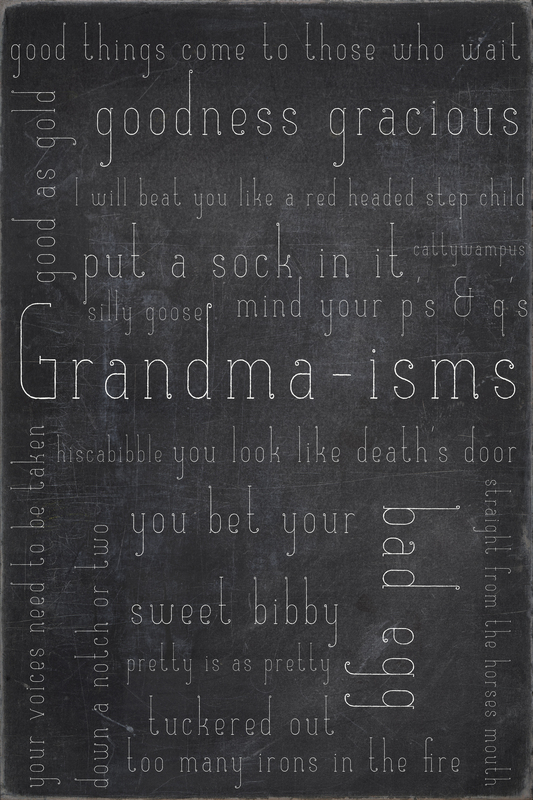 Start with grandma’s basic and put your own spin on it. Balsamic whipped cream, balsamic and black pepper syrup add fresh basil to any or all the ingredients, let your imagination run wild and take our tradition and create yourself a new one. The next stop was back in my Grandma’s kitchen. Breakfast was always a treat whether it was pancakes, waffles, eggs any number of ways (my favorite, and to this day unduplicated, a Swedish egg dish called rara) occasionally (if it didn’t break the bank) my favorite dry cereal or on the best of days… home made donuts. 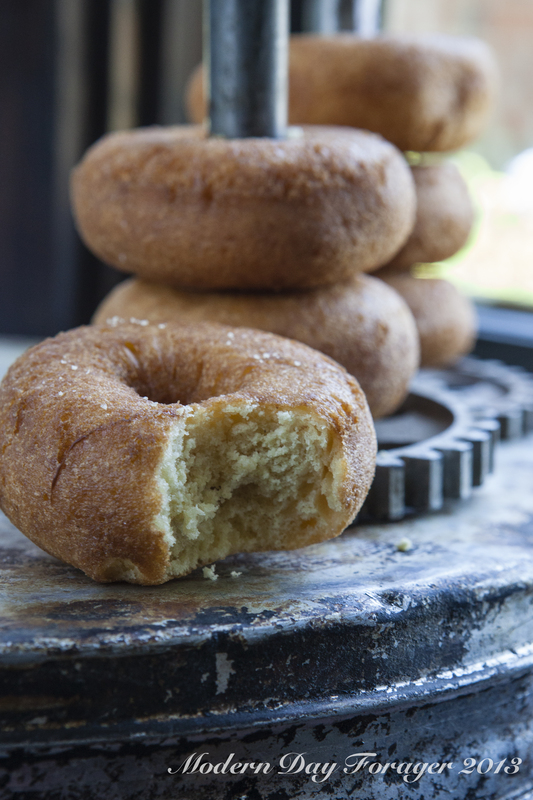 Grandma would carefully make the dough, then cut them out on a giant cutting board, then fry 3 or 4 at a time in a big cast iron pot, finally setting them cattywampus on an old brown paper bag to drain … I would be in charge of bringing the warm donuts to the breakfast nook where my grandfather and I would devour them before the next batch was done frying. I would alternate between powdered sugar, cinnamon sugar and just plain granulated sugar, the whole kit and caboodle, while my grandfather took his plain to dunk in his coffee from the percolator…how could a morning get any better? 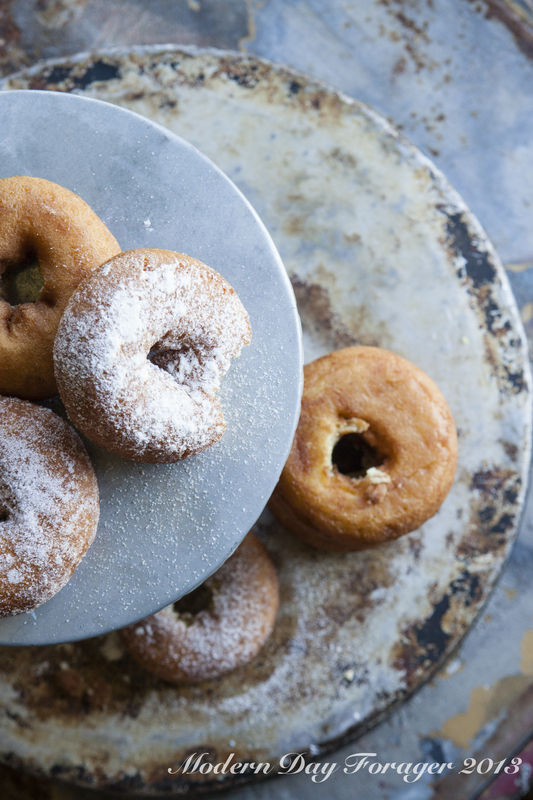 I don’t want to sound like a broken record (do you sense a secondary theme here) but what a great opportunity for you to put your own twist on these magic pieces of fried dough and create a tradition. We hope that everyone understands our grandmothers’ where not disciples of Julia Child, they were not gourmands’, four of these women (not Heather’s she is the spring chicken of the MDF family) lived and fed families through The Great Depression (when hand-made, home-made, recycled, re-used, and re-purposed were a way of life not a trend to be followed) they could stretch a meal and a dollar, but that food, filled with love, tasted so wonderful and could fill you up and warm you up like nobody’s business. Boy do we know it’s summer, (118 degrees F today) but that warm you up feeling was truly something special and nothing did that better or said “grandma” more, than our last post, which was, grilled cheese and tomato soup. Traci’s grandma was ahead of her time; adding different cheeses, serving sandwiches open-faced and utilizing great bread fresh from the bakery. This is another of those traditional staples that screams for you to make your own version and pass down to the next generation. 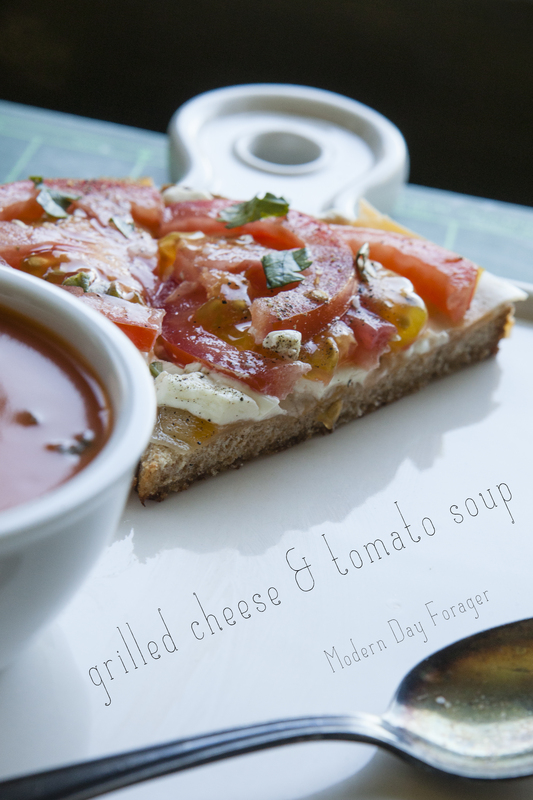 Let us know here on MDFs comment page or on MDF’s Facebook page how you are going to put your stamp on grilled cheese and tomato soup. Pardon me while I get on my soapbox for a moment, I have an ax to grind, and Traci and Heather have bees in their bonnets. These days’ families don’t spend enough quality time together and we are losing traditions left and right. Slow the fork down and start sharing what you hold dear from your grandma’s table and start a few traditions at your table… you will never be sorry you did, you heard that straight from the horses mouth. Just a few more things to ponder, I thought I was done but haste makes waste: That crazy jello salad thing (Ewww)…did grandma like burnt toast or was she taking one for the team? Did we really need rice in the salt to keep it from sticking, or the apple in the potato bag to keep them from sprouting? The bread in the brown sugar sure worked though, so did that tip about putting vinegar in a pie crust to make it flaky. Does warm 7-up really fix anything that is wrong with your tummy? Bacon grease, who didn’t have a can of it under the sink and a tupperware in the ice box? Ok, we have to skedaddle… no more piddling around with this post…Monday’s post is waiting to be photographed. // This Pinterest Hover Button is brought to you by bloggersentral.com. // Visit http://www.bloggersentral.com/2012/11/pinterest-pin-it-button-on-image-hover.html for details. // Feel free to use and share, but please keep this notice intact. 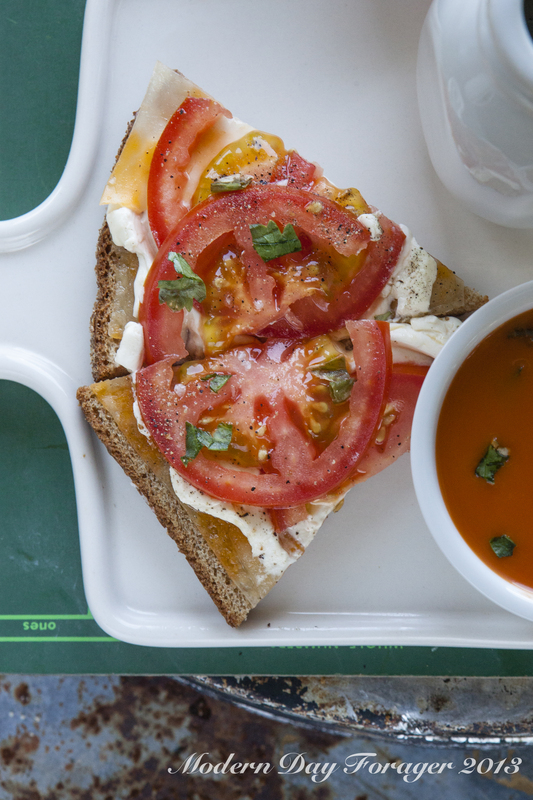 One of my most cherished memories of eating an open faced grilled cheese sandwich, a steamy bowl of creamy tomato soup and a cold glass of milk, is when I was a little girl and my GG , would lovingly prepare me this meal for me whenever I was sick, stayed home from school, or needed some extra TLC. There is just nothing better than having your Grandma take care of you and her making your favorite comfort foods. I could always count on her to do that for me and make me feel special. As a I grew older, the tables had turned , and I was the one lovingly preparing this recipe for my GG to comfort her when she was ill. I will always be very grateful for the time I got to spend with her. Directions: To make the soup, preheat an oven to 400°F. Lightly oil a rimmed baking sheet. Cut the tomatoes in half lengthwise and place them, cut side up, on the prepared baking sheet and brush with olive oil. Roast until the tomatoes look somewhat shriveled, about 45-50 minutes. Let cool for about 20 minutes. Transfer the tomatoes and any juices to a food processor, pulse until chopped, then put the tomatoes and their juices through a food mill placed over a bowl. You should have about 3 1/2 cups tomato purée. Discard the contents and tomatoes skins from the food mill. In a large saucepan, melt the butter over medium-low heat. Add the celery and cook, stirring occasionally, until tender, about 5 minutes. Add the shallots and cook, stirring occasionally, until softened, about 3 minutes. Stir in the tomato purée, 1/2 cup stock, and the basil and bring to a simmer over medium-high heat. Reduce the heat to medium-low and simmer, uncovered, for about 15 minutes. Stir in the sugar. 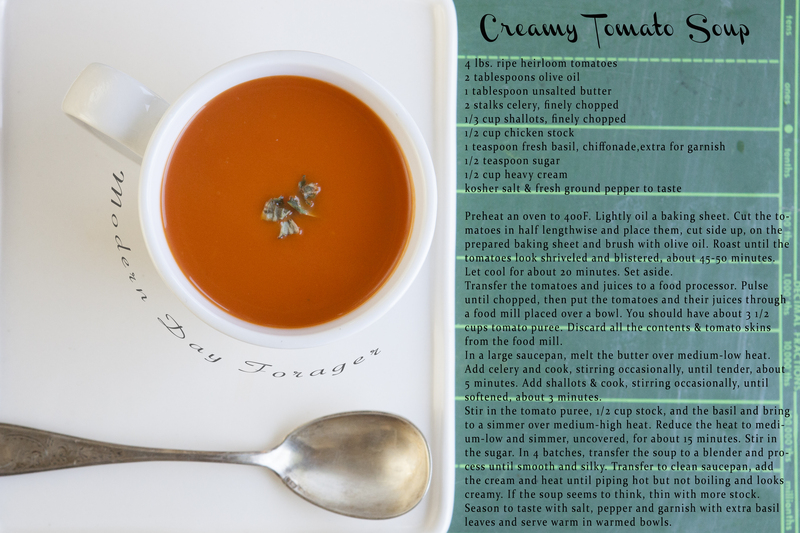 In 3 or 4 batches, transfer the soup to a blender and process until smooth. Transfer to a clean saucepan; add the cream and heat until piping hot but not boiling. 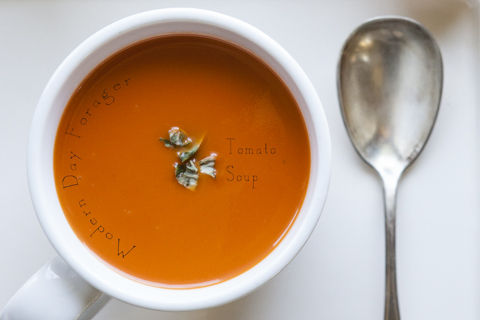 If the soup seems too thick, thin with more stock. Season to taste with salt, pepper and garnish with fresh basil leaves and serve warm. To make the open face grilled cheese sandwiches; heat a griddle or 2 large frying pans over medium heat until hot. 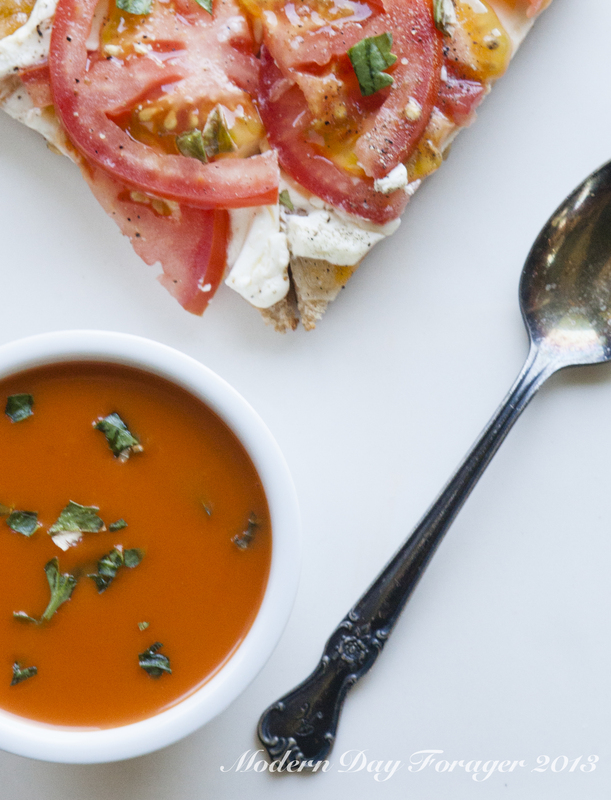 For each sandwich, place one-fourth of the cheese on top of bread slice and top cream cheese, then layer with fresh tomatoes, season with salt, pepper and garnish with extra basil. Place on the griddle, reduce the heat to medium-low and cook until the undersides are golden brown, 3–4 minutes. Ladle the soup into warmed bowls. Serve and enjoy!!! 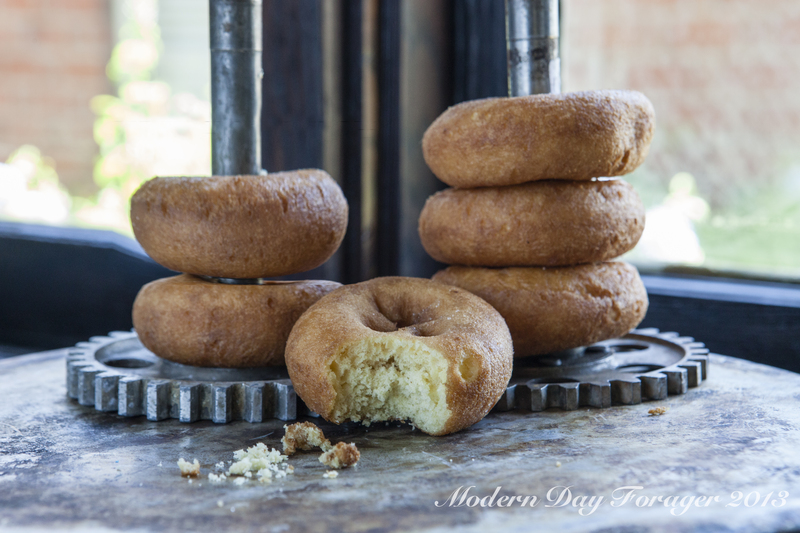 Donut or Doughnut …no matter how you spell it, there may be nothing more satisfying to put in your mouth than a hot and fresh one of these old fashioned, hand-cut pieces of fried dough. Pre-heat oil in a large Dutch oven or pot to approximately 375 F.
Combine flour, sugar, salt, baking powder and nutmeg. Stir in milk and eggs. 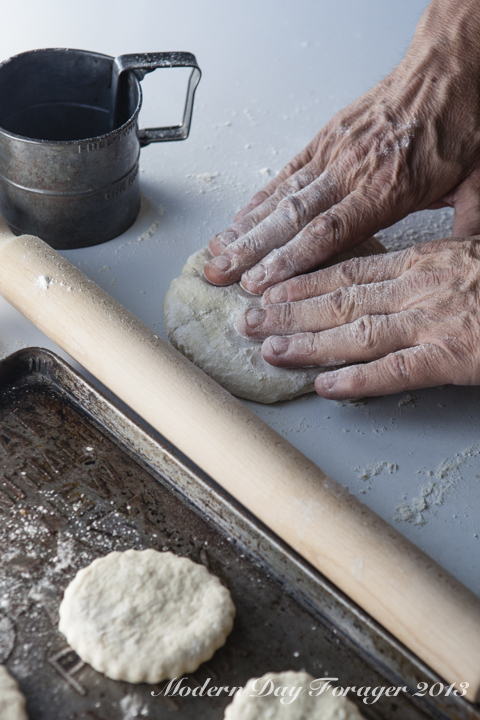 (This step was done by hand on a large floured cutting board in grandma’s kitchen) Divide dough into easy to work with portion and spread out to about 1/4 inch thickness. 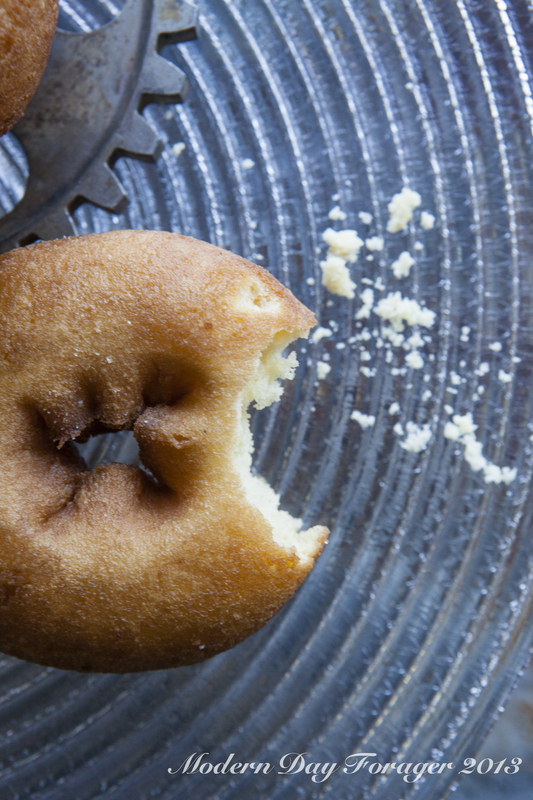 Once you have cut out all your donuts drop them into hot oil, just a few at a time. Fry about 3 minutes, turn and fry for about 3 more minutes or until golden brown. Sprinkle with powdered sugar, cinnamon-sugar, or neither, just plain. 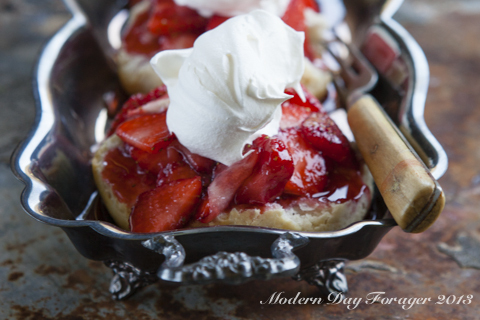 Combine 1/2 cup sugar and 1/2 cup crushed strawberries. They will be syrupy. Add this to the remaining sliced strawberries. 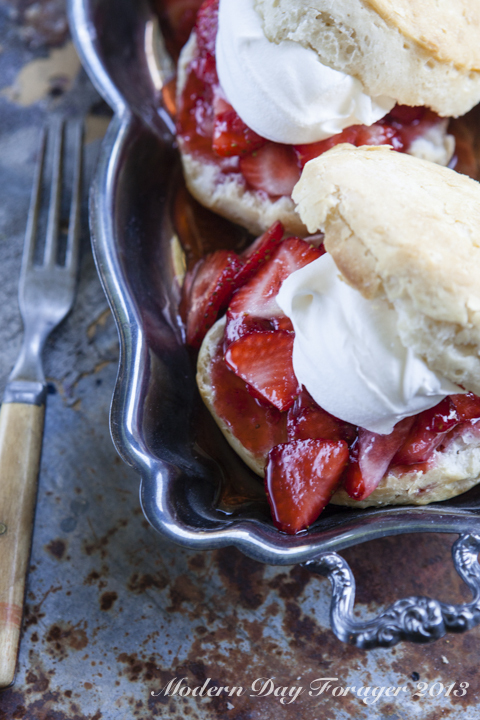 Serve over biscuits and top with fresh whipped cream. In a large bowl, whip cream until stiff peaks are just about to form. Beat in vanilla and sugar until stiff peaks form. Make sure not to over-beat, or you will have butter. We used the biscuits from yesterdays post. In case you didn’t catch it here is the recipe again. Preheat oven to 425F. Grease baking sheet with lard and set aside. In a small bowl, dissolve yeast in warm water, let stand until it becomes foamy (5-10 minutes). In a large bowl, combine the flour, sugar, baking powder, salt, pepper, cream of tartar and baking soda. With a pastry blender or two knives, cut the lard into the flour mixture until pea sized coarse crumbs form. Make a well in the center of the flour mixture, add yogurt and yeast all at once and carefully toss with a fork until just moistened, careful to not over mix. 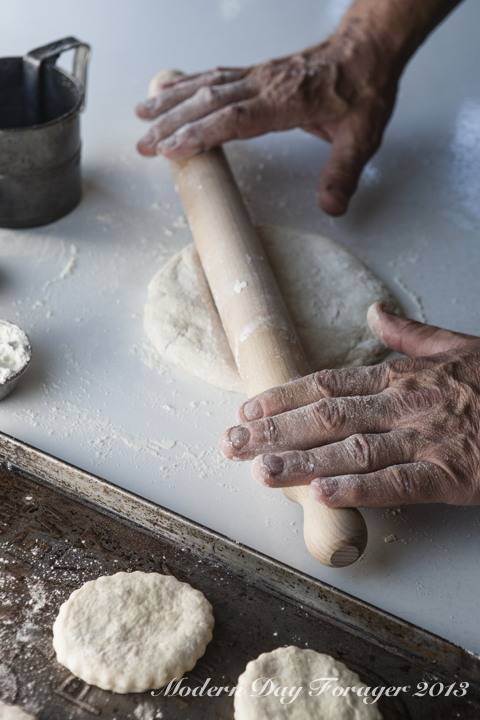 Flour your work surface; roll out the dough to 3/4 of an inch thickness using a rolling pin. Cut the biscuits using a 2 1/2 inch round biscuit cutter. Gather trimmings re-roll and cut. Place biscuits 1 inch apart on the prepared baking sheet. Bake for 12-15 minutes until golden brown. Leave to cool for 5 minutes on wire rack, serve warm. *** For a MDF take on Grandma’s Classic ***Replace vanilla extract with balsamic vinegar or any of your favorite extracts and/or bitters, then for an urban table twist try a chiffonade of basil. 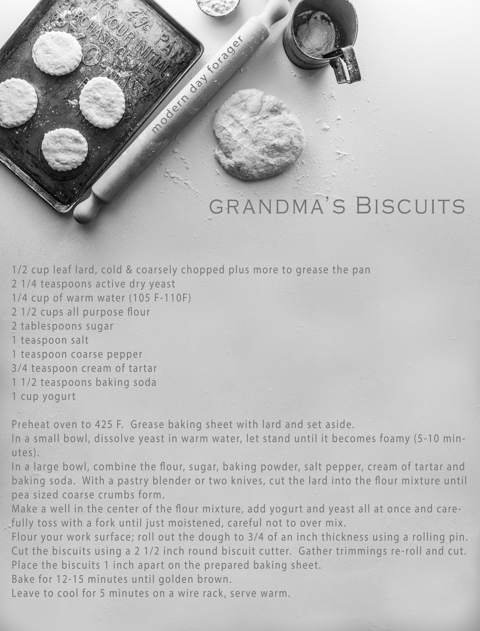 Here is a tried and true recipe from my dear grandma who made these by the dozens for my family and boy did we feel special when she made them and we ate them. 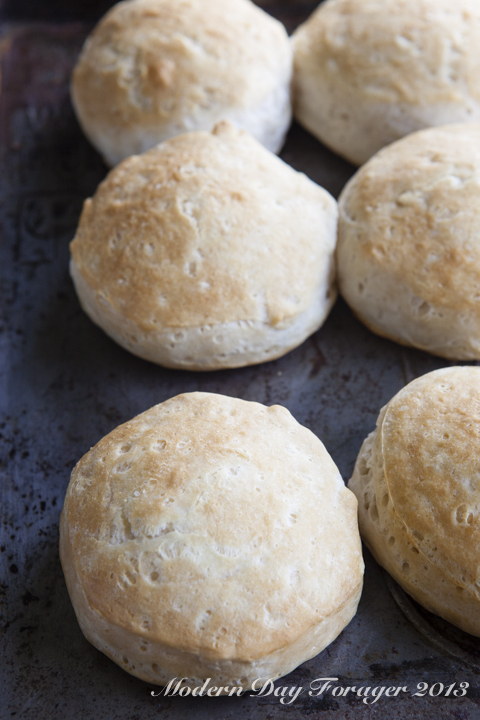 If you master these biscuits and know your biscuit basics you will be on your way to making a mouth-watering golden brown biscuit with a soft and tender interior. Make a well in the center of the flour mixture, add yogurt and yeast all at once and carefully toss with a fork until just moistened, careful not to over mix. Cut the biscuits using a 2 1/2 inch round biscuit cutter. Gather trimmings, re-roll and cut. Place the biscuits 1 inch apart on the prepared baking sheet. Bake for 12-15 minutes until golden brown. Leave to cool for 5 minutes on a wire rack, serve warm. We don’t know about your grandmas’ but ours made freezer jam every summer. We remember picking the fruit for grandma to use, she really didn’t get many since we were allowed to eat as we picked, but that was half the fun! If you don’t like to can, this is for you. 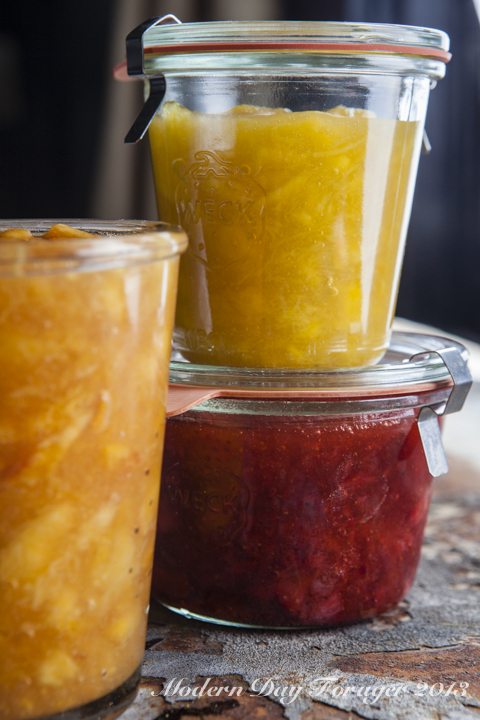 Freezer jams use less sugar and you if you prefer you can omit pectin. 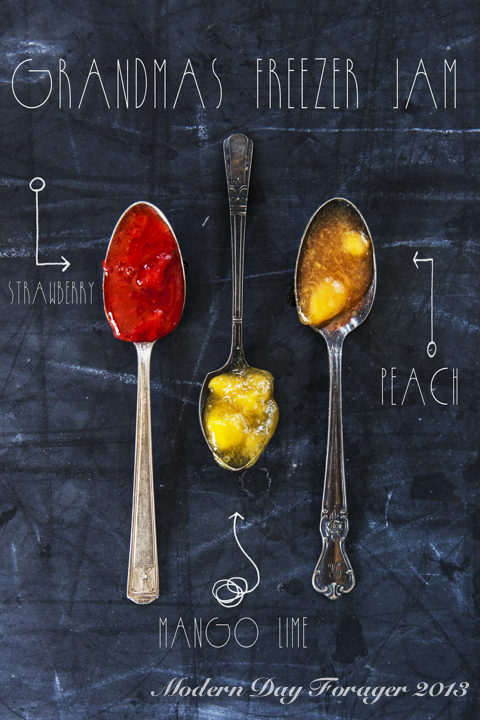 We are giving you 2 recipes today – one with pectin and one without. We used Ball products for this jam, they have great plastic containers and we have always had success using their pectin for freezer and canned jams. Combine all ingredients and put in plastic jars. Let them set up for 30 minutes before putting them in the freezer. Put one in the refrigerator a couple hours before you want to use. And how simple that its no cook. We love to eat this jam on homemade bread! With fruit being just about perfect right now, this is something you could do tonight and use this weekend. Our grandmothers would never have made mango lime but we would! So for this one we put super ripe mangos and fresh limes without pectin together. Combine all ingredients in a medium sauce pan and cook on low for about 30 minutes. Let cool for a bit (8-10 minutes) then add jam to plastic jars (we used Ball) and let cool completely before adding lids and transferring them to the freezer. You can also cool them in a water bath if you like to speed up the process and keep them out of the danger zone, 40-140 degrees. You can substitute almost any fruit with this. We chose mango and lime together not only because its tasty but also because the lime helps with the natural pectin that is lower in mango. Both of these recipes would double well if you want to make a larger quantity. 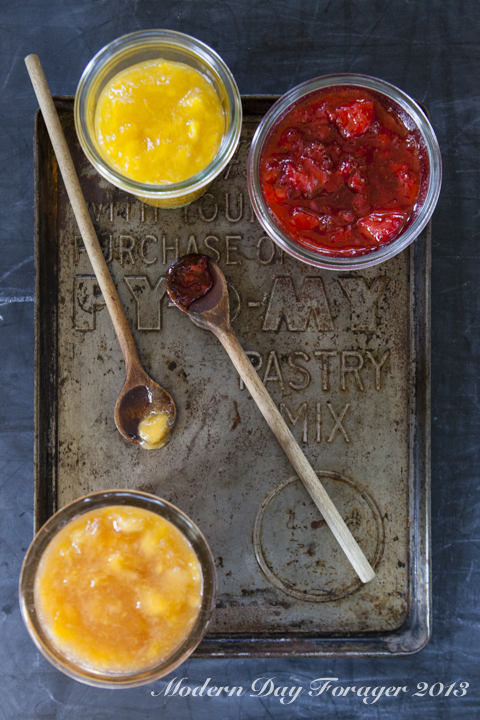 We would love to know if your grandmother made jam. Did you get to help? And if so, what part did you play? Please connect with us in the comments or on our Facebook page. Granny, grandma, grandmother, nana, nona. Whatever you called her we are celebrating her and time honored traditions this week. 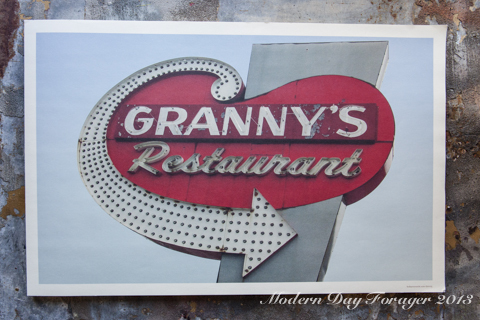 For us at MDF, our grandmas centered around cooking, eating and family. Their recipes were always lovingly prepared and harken back to a simpler time. Everything depended on what was at hand, available and fresh in the garden and nothing was ever wasted. No shortcuts were ever taken and many of the meals we have all grown so fond of, came out of the kitchen because of necessity to stretch a meal or a dollar. Our grandmothers stories, recipes and wonderful anecdotes enriched our lives and awakened our love for food and feeding people. 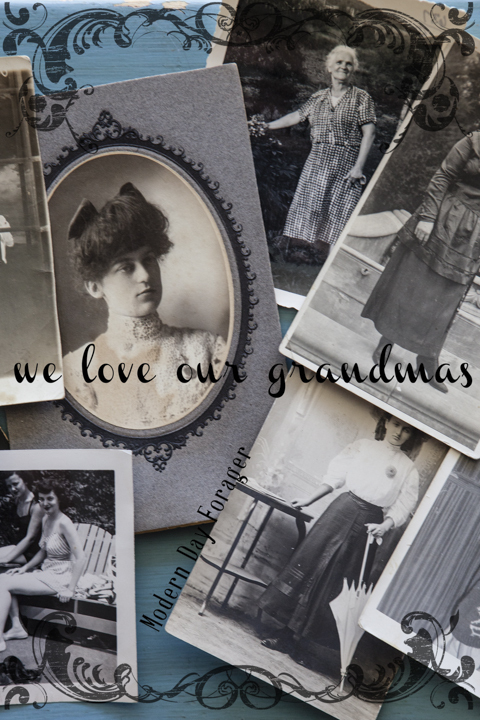 Over the coming days we will share with you some charming stories, treasured family recipes, steeped in tradition and what we like to call “grandma-isms or our version of grandma sayings.” We would love to hear about your grandmother. What do you remember about her? Do you make recipes that she made for you as a child? Please connect with us in the comments section or on our Facebook page.